Academy Charter School is proud to announce that they are the recipient of the John Irwin Award. 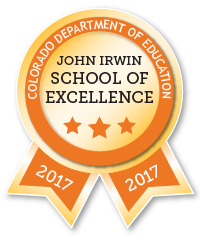 The John Irwin awards are given to schools that demonstrate exceptional academic achievement over time. These schools receive an Exceeds Expectations rating on the Academic Achievement indicator of the School Performance Frameworks reflecting exceptional performance in Math, English Language Arts, and Science. Come support your friends and classmates that are in and have worked on the production of Beauty and the Beast! Our school show will only showcase a few songs, to see the whole play you need tickets. We have student tickets on sale for $5! Remember how much you loved the Scholastic Book Fair? Make new memories with your child at the book fair April 29th - May 2nd. Academy Charter School is a Kindergarten through 8th grade charter school. We are a publicly funded school founded by a parent group in 1993. The building we are currently in was first opened for students in 2001. Our school offers unique educational opportunities through our Core Knowledge Curriculum, our core virtues, and rigorous academics. Our parent community is highly involved in the education of our students and are required to volunteer in the school 20 hours per year. We offer Spanish for K-8th grade along with technology, art, music, and PE. At Academy Charter School, a quality education includes a student-centered approach to learning. In addition to academic and cognitive development of students, Academy Charter School promotes the physical, social and emotional health, growth and skill development of every student. We implement an approach to learning that integrates research-based practices to address students’ academic and behavioral needs. We create targeted, specific prevention, remediation and/or acceleration interventions for students whose academic achievement or behaviors are not typical of their grade level peers. Acceleration or remediation is used to match students’ general abilities and specific talents with optimal learning opportunities. We strongly believe in a whole child approach to learning, strong partnerships with parents, and research-based best instructional practices which promotes a quality education for every student. Please browse our website for more valuable information or contact us directly.